When visiting Kolkata, many people like to stay in and around Park Street. 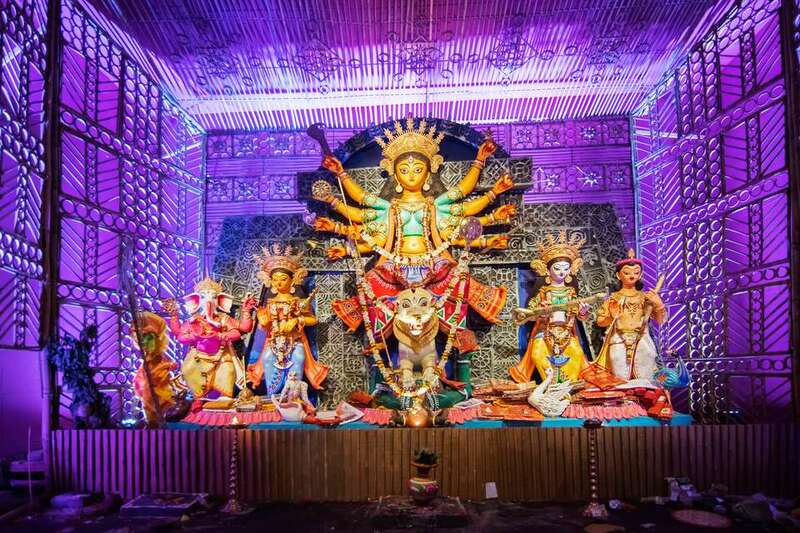 However, during Durga Puja, it's not the best location in which to stay because the famous Durga Puja pandals are all located away from this area, many of them in north and south Kolkata. Between the two areas, south Kolkata is definitely more appealing, with more facilities, flashier celebrations, and a number of boutique hotels and guesthouses from which guests can choose. Durga Puja celebrations in north Kolkata tend to be more traditional, albeit definitely worth experiencing. Decent accommodations are limited though. Staying in central Kolkata is an option, as there's plenty to see there as well. Here is a list of convenient places to stay for Durga Puja in Kolkata. The Bodhi Tree is the place to stay in south Kolkata. This soulful boutique hotel fused with a homestay is simply divine. It's a place of remarkable harmony, with spirituality as the underlying theme. Statues and pictures of the Buddha grace the property. It also has an art cafe, a very Zen garden, and a patio library. Amazingly, the decor was all designed by the well-traveled owner. The hotel is close to Rabindra Sarovar Metro Station, in the quiet residential area of Swiss Park. There are a number of accommodation options available, including serviced apartments with kitchens. Rates: From 2,500 rupees per night. Breakfast and wireless Internet are free. The hip heritage Corner Courtyard boutique hotel is housed in a restored 110 year old zamindar bungalow. It is named for its location on the corner of Sarat Bose Road in Bhowanipore in south Kolkata (about 20 minutes from Park Street). The property's interiors eclectically mix painstakingly restored antique furniture with contemporary splashes or color, and the restaurant serves fusion cuisine. Each of the seven guest rooms is individually themed around an aspect of the city. Foodies will especially be happy at this hotel. Its restaurant serves gourmet European cuisine and very good coffee. Staying at a homestay or bed and breakfast is a good idea during Durga Puja, as you'll receive personal attention and advice from the hosts. Central Bed and Breakfast is among the best in the city, with a handy south Kolkata location about 10 minutes from Park Street. The accommodations consist of four guest rooms inside a big apartment, in the same building where the owner lives. The property offers fabulous city views, a communal living room, fully equipped kitchen that guests can use, and a treadmill for fitness fanatics. It's clean, safe, and a great value for money. For a luxurious stay in an upmarket south Kolkata neighborhood that is close to many popular Durga Puja pandals, the new Radisson Kolkata Ballygunge is the place. The hotel has three bars (including one on the rooftop), two restaurants, a coffee shop, a spectacular outdoor infinity swimming pool, spa, fitness center, business center, and 92 guest rooms. Close To: Ballygunge, Singhi Park, Gariahat, Jodhpur Park. The Relax Inn opened in late 2011. It's a cheaper option that the Radisson in south Kolkata's Ballygunge neighborhood. There are 11 clean and attractively decorated rooms, housed in a converted apartment building. The hotel is particularly popular with foreign guests, who appreciate its notably friendly and helpful staff. Note that it's more like a bed and breakfast though, as it doesn't have a restaurant on the premises. Instead, food can be ordered and delivered from nearby places. Rates: From around 2,800 rupees per night for a double room. Breakfast is included. A little further out in Gariahat, the Residency is a recommended budget option. It's a homely boutique guesthouse with 18 rooms, spread across two wings (the larger and better rooms are in the new wing). Lovely views can be had from the rooftop. The peaceful, leafy location is very safe, and near many shops and restaurants. Guests appreciate the excellent hospitality. Rates: About 2,500 rupees per night for a double room. Calcutta Bungalow is a very welcome addition to the hotel scene in north Kolkata. You'll fall in love with the gorgeous renovation of this 1920s townhouse, with decoration by renowned local designer Swarup Dutt. It's located in the heart of the atmospheric Bengali part of the city, which the British referred to as Black Town. The decrepit property was saved from being converted to a high-rise building by a group of friends, one of whom runs Calcutta Walks (so, you'll be all set for Durga Puja tours). Notably, nearly everything that was part of its old structure has been reclaimed, recycled or up-cycled. There are six character-filled bedrooms spread over three floors. The Lalit Great Eastern is a luxurious option, located near BBG Bagh in the business district just north of Park Street. This stately hotel has a long history. Constructed in 1841, it has the distinction of being Asia's first luxury hotel. It's been restored to its former glory over the last seven years and blends Victorian, Edwardian and contemporary architectural styles. There are 195 guest rooms, two restaurants, a pub, bakery, tea lounge, swimming pool, spa, and business center. Although it doesn't look very appealing from the outside, Hotel Cecil has received a makeover inside and is now one of the best budget hotels in Kolkata. The hotel overlooks College street in central Kolkata. This neighborhood is about 10 minutes north of Park Street, and is renowned for its secondhand book market and historic Indian Coffee House. The hotel is well-run, with helpful and efficient staff. It's kept super clean and comfortable. Plus, it is regarded as being particularly safe for female travelers. Rates: From around 2,800 rupees per night. Breakfast is included. Looking for an inexpensive, no-frills hotel and don't mind basic facilities? Legendary Hotel Broadway is your best bet in central Kolkata. The hotel is located in Kolkata's business district, opposite Chandni Chowk Metro train station (useful for those taking public transport to Puja destinations). The hotel was built in 1937 and hasn't been updated much since, but it's full of Colonial charm, with huge airy rooms, friendly staff, and good food. There is also a bar with cheap beer on the premises. For a completely different experience during Durga Puja, stay at Kolkata's floating hotel. The eco-friendly Floatel Hotel, modeled on a cruise liner, is moored on the banks of the Hooghly River near Babu Ghat. It's well positioned to catch the action on the last day of the festival when the idols are immersed in the river. There are 49 guest rooms. The hotel's rooftop restaurant offers panoramic views.